This month I was paired up with fellow FitFluential Abassador, Annica for Foodie Pen Pals. I know I say it every month, but coming home to these goodies at my doorstep is such a treat. I order a lot of stuff online (oops), but this is always my favorite package! If you haven’t joined yet and are thinking about it – do it! There are details of how to join below. I received my package just after finding out my gastroenterologist wanted me to temporarily cut out dairy. Naturally, I cursed myself for mentioning how much I love chocolate, because of course Annica included a delicious looking chocolate bar! Thankfully, I was able to enjoy everything else in the package, and had all the crackers as my go-to snacks over the past two weeks, as the only crackers we had in the house were Cheese It’s. I was so excited about the rice crackers, I wound up devouring the entire bag before snapping a picture! They were an interesting twist on a typical chip, and reminded me a lot of a tortilla chip since it was on the grainy side. There were also some tomato & basil crackers which were so flavorful – they were a lot like a pita chip (with that fluffy crunch, if that makes any sense), rasberry chipotle salsa, and blueberry granola. I’ve never had jarred fruit salsa, but this one is good! I love chipotle, so I knew it was right up my alley. It’s a great smoky/sweet combo, and most of the jar is already gone. I’m also a huge fan of the blueberry granola – it tastes like a blueberry muffin, and has been so delicious with some vanilla almond milk! While I haven’t been able to try the mint chocolate bar, FiberOne bar (one of my favorites! ), or the tortellini, I’m anxiously awaiting the go-ahead from my doctor to have dairy again. When I get the OK, you better believe I’ll be sampling each of these goodies! I’ve also been saving the Gevalia coffee because I know how yummy it is, but I think I’ll be giving in soon. Everything was so delicious, and Annica did a great job picking out some really fun treats for me to try – I love getting to sample new things! I had the privilege of sending some goodies to Heather, and since she doesn’t have a blog, I offered for her to do a review here! This month I decided to try something new, Ive really been trying to eat healthier and make better choices and try new things. I ran accross this awesome blog http://www.theleangreenbean.com and on this blog found something called FOODIE PEN PALS turns out it’s this amazing program to exchange food with others – If you haven’t heard of it you definitely need to check it out! It’s a great way to meet new poeple and find new blogs to follow with amazing recipes and ideas! First i found a bag of Trade Joe’s Peanut Butter Chocolate Covered Pretzel Bites, we are in the process of remodeling our house so i thought i would put these away for a day when i needed a little snack in the middle of painting. Well turns out that day wasn’t too far down the road and i made the mistake of opening the bag while my family was over helping us work on the house. The bag was gone in no time, they were AMAZING!!! These were a huge hit with help and like Danielle said “dangerously addictive” possibly it’s a good thing I dont live near a Trader Joe’s! 🙂 Well after that chocolate kick we decided to go ahead and try the chocolate and almond bar – AGAIN AMAZING!!! I was glad there were lots of other people there to help me eat it otherwise I’m sure i would have had no problem devouring it all to myself!!! Also included in my box was a fiber one bar – I took this with me to eat after one of my 5k races – loved it, I have since bought a box and keep them on hand at the house. I also found a bag of Trader Joe’s Nut and Berry mix it included Almonds, Cranberries, Raisins, Cashews, Blueberries, Walnuts and Raspberries. I would never have thought of snagging this up on my own but beings that i got it i thought what the heck and tried it and sure enough LOVED it. This bag went with me to work for my mid-day snacks on several days! On one day i picked a few of the dried fruit out and put them on top my chocolate rice cake covered with pb2 mix – FABULOUS!!!! Could not believe how good this mix was loved it all! And to top it off i also received some altoids, a little fresh breath after all my yummy goodies!! Thank you Danielle for the AWESOME box of goodies can’t wait til i receive my next box next month! 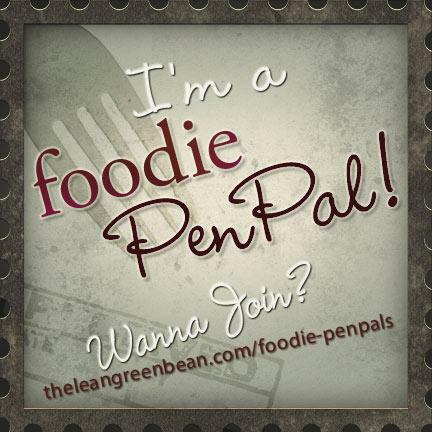 If you are interested in joining the Foodie Pen Pals, check out the details below! Big thanks to Annica for the awesome goodies, and to Heather for the wonderful words about what I sent her! *If you’re from somewhere besides the US, Canada or Europe and want to participate, send Lindsay an email and she’ll see if we get enough interest this month!